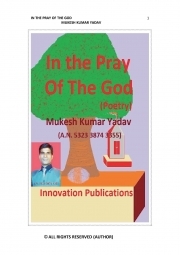 Description of "In The Pray Of The God (eBook)"
Delicacy of the streams of the emotions fills the heart with joy,sprituality in the thoughts fills the mind with holiness,philosophy of the god fills devotion in the life and the beauty of love makes live to the every moment of life.By the power of god living and non living things are in existence.God is the aim of life,source of life and god is the inspiration of every moment of life also. All the moments in the life has an energy flow.Although this energy flow has no any certain physical form,but has powers to do great works. A stream of emotions of devotions was in my mind from childhood which turned every moment of life towards great writing about god and “In The Pray Of The God” is its result.As difficult is writing, so difficult is life. This book has not only poems having some words , this book has moments of life having breath also.To write something good is not less than penance and thousands of the great souls has done this penance.I am also one of those lucky persons to whom god has provided the virtue to do this great job.I began to write from the age less than fifteen and I am writing continuely. I always think about the god who is the inspiration of my writing.The god who is not visible in this world, but is in everything of this world.World is the expance of its virtues. The god who is immortal always inspires me to be immortal and this inspiration gives me power to work hard. Reviews of "In The Pray Of The God (eBook)"